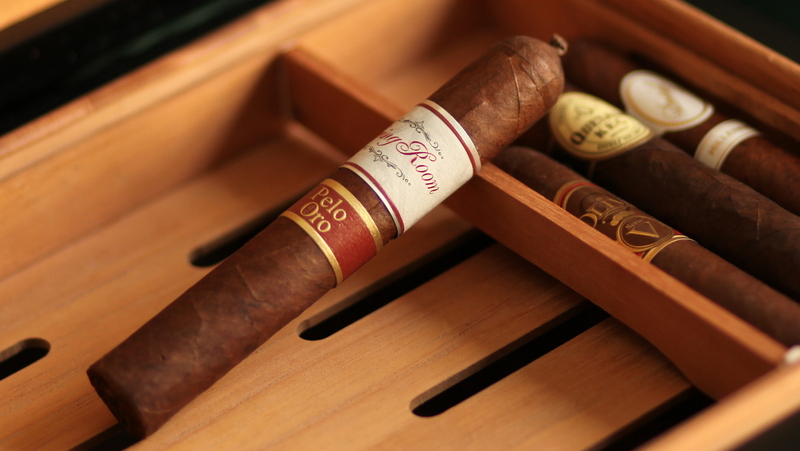 Up for review today is the Aging Room Pelo de Oro. 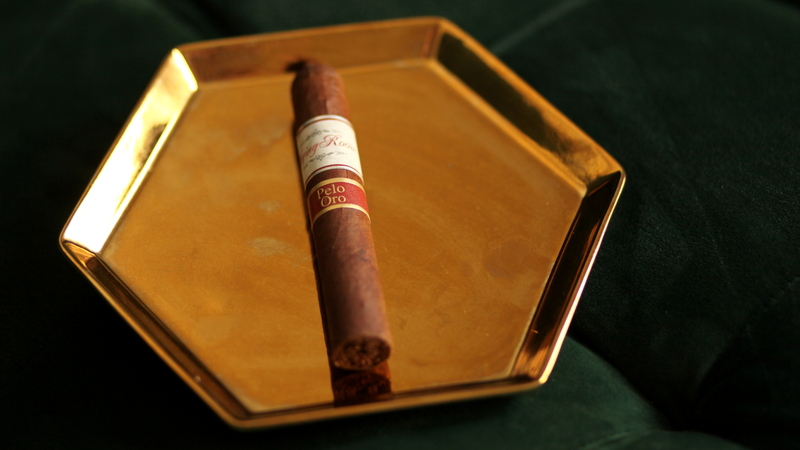 Besides its gorgeous branding, the Pelo de Oro is notable for its filler tobacco. Pelo de Oro (which translated means “golden hair” in spanish) is a difficult to grow leaf, with high susceptibility to disease and low yields. At the time of purchase, I didn’t know that Rafael Nodal produced the cigar with AJ Fernandez. If I had known, I would have purchased this cigar and reviewed it much sooner after its release in 2016, because Fernandez + Nodal is a dynamite combination. Lots of aroma off of the foot, a good sign. Some pepper, cedar, leather, and earth. The wrapper is a dark, marbled brown, with a few water spots and holes in the leaf (fairly surprising to find these imperfections). When squeezed, the cigar has very little give, and is this way consistently down the cigar. The pre light draw has optimal restrictiveness and gives aromas of sweet hay, earth, and coffee. The branding itself of the cigar is great, definitely my favorite among any of Aging Rooms cigars. Both bands, though different, have classic and complementary looks. This really is how I think every Aging Room should be presented, but that will be up to Rafael going forward. The Pelo de Oro opens with rich, albeit dry, medium to full bodied smoke, and it’s hard to tell immediately what flavors are present. I pick up lots of spiciness, some black pepper on the retrohale, and additional notes of toasted bread, mild and dark chocolate, burnt espresso, a tin flavor, and hints of vanilla on the finish. At an inch in, the white ash is solid and quite impressive, with little splitting or fraying. The tin flavor has thankfully dissipated as well. The cigar produces a decent amount of smoke though I’d prefer a bit more. Moving into the second third, the chocolate note gains dominance, along with an apricot note that is unique and complements the chocolate well. Smoke production has also increased nicely. At about halfway, the burn deviates a bit but quickly corrects itself. The strength also dials down a bit, bringing a sweeter profile to the fore, with cinnamon toast, nuts, cocoa, and a bit of molasses. In the final third, the strength decreases again, though less than in the second third. Overall the profile is moderately sweet, with great complexity and harmony of flavors. The black pepper that was initially so dominant I think has found its rightful place as a supporting character. I was pleasantly surprised by the Pelo de Oro. The balance between chocolate, apricot, nuts, cocoa and molasses was really special. From a construction standpoint, the cigar is nearly flawless, with the exception of trouble with smoke production at times. At around $15, Pelo de Oro isn’t cheap, but it’s a cigar I’ll be having again soon and recommend.